The biblical Shemitah was the year of rest, Sabbath, cessation, that came every seven years to Israel. The Shemitah brought cessation to production, trade and economic activity, and ultimately, a nullification to the nation’s financial realm, the wiping away of credit and debt. The Hebrew people count and observe 7 year cycles. Every cycle would fulfill a "Sabbatical Year known as a "Shemitah" or "Shmitah" and means, "to release!" Could this ancient pattern, established by God, manifest even in the modern world and affect modern economies, financial systems and stock markets? The amazing answer is yes! In the Shemitah of 2001 and 2008 an amazingly precise phenomenon occurred in which the greatest two crashes in Wall Street history each took place on the same exact biblical day, the last day of the biblical Shemitah, Elul 29, the Day of Nullification, appointed from ancient times for the wiping away of financial accounts – a day that only comes around once in seven years. This particular day in the Shemitah was a very special day. On this very day, the 29th of Elul, once every 7 years, was the last day Israelites had to scramble to erase debts and settle accounts by year end. 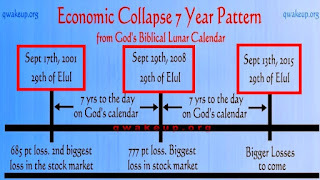 In the same way, God has given us a sign of this through the 2 biggest point stock market crashes in American history, 2001 and 2008, both of which occurred on the very day of the 29th of Elul, down to the day, the hour, the minute, and the second! No small miracle! 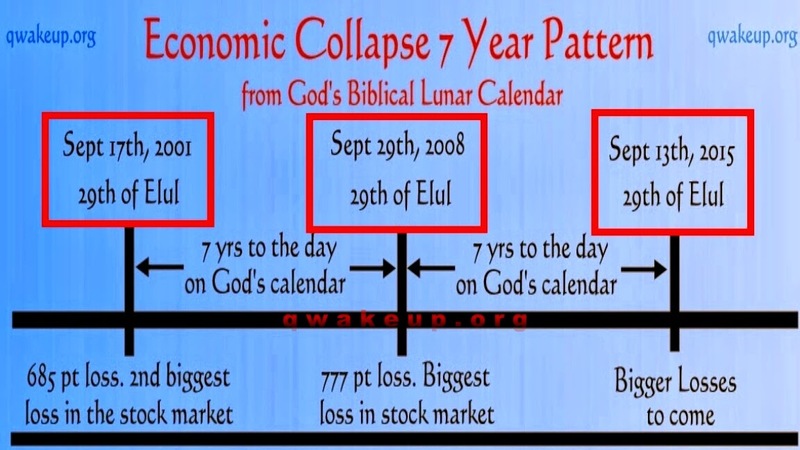 What is even more of an amazing sign to compile, is that the 2008 stock market crash happened in the 7th month of the sacred calendar, at the 7th year, falling 7%, with a 700 billion bailout plan and the market fell that 29th day of Elul 777.7 points! Interestingly, if you add the year of this event (2008) plus the corresponding Jewish New Year (5769, which began that evening on the Hebrew calendar), it also arrives at the total of 7777. A remarkable coincidence! 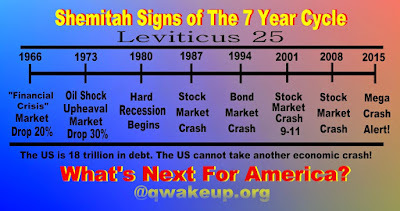 How many 7 signs do you need to see, God's hand is in on this 7 year economic judgment cycle? The number 7 means fullness or completion, where we get the word several or to sever, a cutting off! So the blessings of America are being cut off by the 7 year cycle God is using to awaken us to repent from sin and turn to the Lord Jesus Christ to be saved! 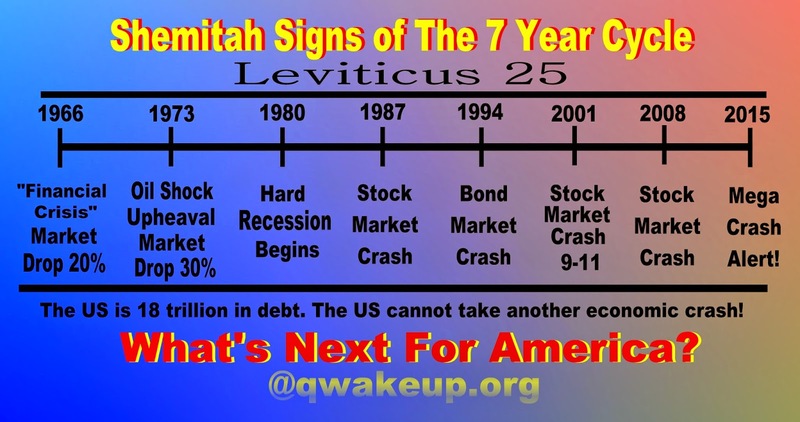 The two greatest stock-market crashes America had ever know, both taking place on the exact Biblical day separated by the exact period of time ordained in the Bible… 7 years to the day… both occurring on the one Biblical day appointed for the wiping out of credit and debt! Coincidence…? 1901-1902 Shmita Year - 46% U.S. Stock market value wiped out. 1916-1917 Shmita Year - 40% U.S. Stock market value wiped out. German, Austro-Hungarian, Russian and Ottoman Empires collapsed. Britain, the world's greatest empire was almost bankrupt. The beginning of American to rise to world power. All during this one Shmita year. 1930-1931 Shmita Year - 86% U.S stock market value wiped out in the worst financial crisis in modern history. 1937-1938 Shmita Year - 50% U.S. Stock market value wiped out. Global recession. 1944-1945 Shmita Year - End of German Reich and Britain's hold on territories. Establishment of America as the world's super power. 1965-1966 Shmita Year - 23% stock market value wiped out. 1979-1980 Shmita Year - U.S. and global recession. 1986-1987 Shmita Year - 33% U.S. Stock market value wiped out. 1993-1994 Shmita Year - Bond market crash. 2000-2001 Shmita Year - 37% U.S. stock market value wiped out. 9/11 and Global recession. 2007-2008 Shmita Year - 50% U.S. Stock market value wiped out. Global recession. 2014-2015 Shmita Year - The most predominant dynamic of the Shemitah manifested yet again. 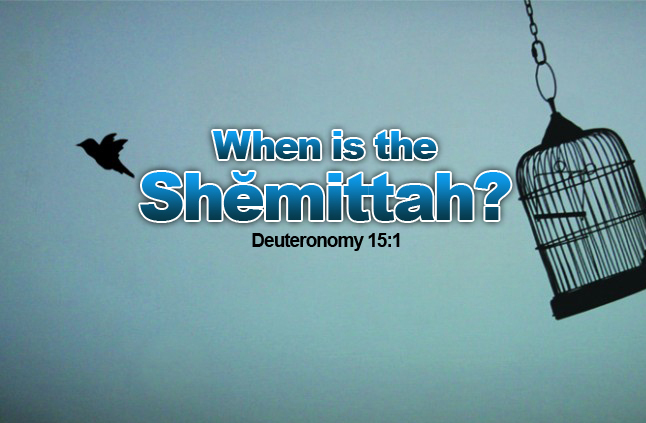 Each Shemitah year most often starts and ends in September. From September to September is the Shemitah year and each of these crashes we've experienced as a nation, for the last century, have been on a Shemitah year! Elul 29 is usually always in September, and this explains why people cannot understand why September is a historically bad month for stocks. However, having an understanding of the biblical Shemitah years can explain why. These significant Shemitah years, occurring 7 years apart, are beyond coincidences! God is real! See the previous article on ancient Israel and America's uncanny link, here.